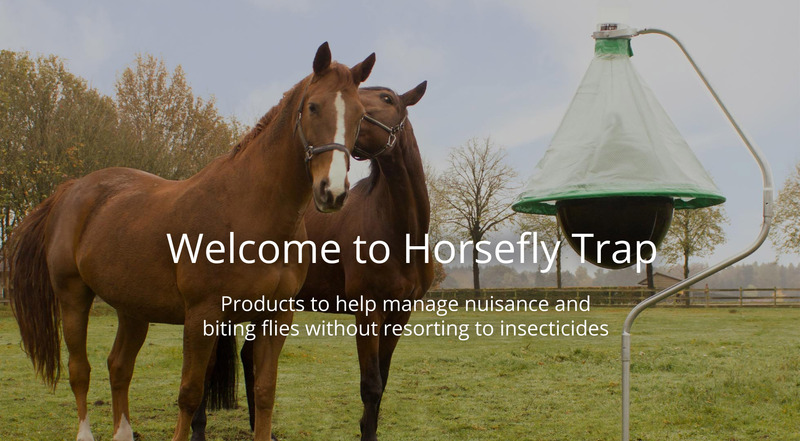 Welcome to the Horsefly Trap website where now, in addition to the famous H-Trap for horseflies, you can find a full range of products to help manage nuisance and biting flies without resorting to insecticides. Our portfolio of products has been tried and tested by our customers over many years and we are pleased to offer, not only effective fly control solutions, but a friendly and personal service. So whether you are a horse owner, a neighbour to an equestrian property, a farmer, a rural dweller or just someone plagued by flies, feel free to browse. Price promise: we aim to provide personal and reliable service, advice and of course great value. Since last year (2018) we have reduced prices on several items to ensure our offer is competitive to other similar products now appearing on the market. If you see the same products available elsewhere do please get in touch before placing an order as we aim to ensure our customers are happy to buy from us. The H-Trap Professional Horsefly Control System uses no chemicals and yet can reduce horsefly numbers to give long term protection to you and your animals. It uses the female horsefly’s natural hunting instincts against it, by providing an artificial target for it to land on and then become captured. Removing female flies has a long term effect on the breeding population and so reduces their presence and biting threat over successive years. First introduced into the UK by Sentomol in 2013, the H-trap system has grown in use and popularity and many British horse owners have added their voice to the success that has been experienced all around the world. Extensive independent trials have shown a reduction of 90-95% in horsefly numbers in areas protected by H-traps can be realised. In 2016 Sentomol introduced the H-Trap’s baby brother, the MT-Trap, which adds greater flexibility in creating an area-wide, fly-free zone and an affordable option for those non-horse owners wishing to also have protection in gardens, around swimming pools, while camping and in other public spaces. Sentomol specialises in the supply of insect pest management products and in addition to the H-Trap available in our webshop, we offer a range of additional fly management products for use in and around the stable and other outdoor working environments. If you cannot find the product here that you need, please do get in touch. Sentomol is a pest management product supply company that aims to deliver monitoring and trapping solutions that can help manage insect pest problems without using or minimising the use of pesticides. We are involved in various novel projects investigating how pheromones, attractants and traps can best be developed and adapted to learn more about the pest species we live with and to produce tools to help manage them. We supply not only the UK but we annually ship to 4 of the 7 continents and are working hard to find customers within the other 3. If you are interested in any aspect of our business, or wish to source products and are outside the UK, then please do get in touch. We’d be pleased to hear from you. Sentomol first saw the benefit of the H-Trap for controlling horseflies when the traps were tested at a nearby horse hospital. Since then Sentomol provided horsefly traps to the Society for the Welfare of Horses and Ponies, which was been run as a horse hospital for more than 35 years. The SWHP cared for sick, injured or abused animals and nursed them back to health. SWHP used to be run from the MacGregors’ farm close to the home of the Horsefly Trap. On 1st February 2019 the organisation merged with Redwings, and the hospital has relocated to an 86 acre site, Sheepcot Farm, near Chepstow, Monmouthshire. The merger with SWHP means that Redwings is now responsible for over 2,000 rescued horses across the UK, including 700 living out in Guardian homes.